In March 2012 we kicked off our blog with the announcement of Comtrol’s first “-VB” enabled PoE switch. 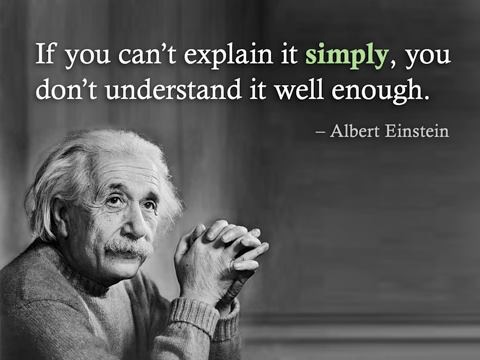 What is “-VB,” and what made it such a notable product at the time? The answer is “Voltage Boost,” the Comtrol designation for our industrial PoE Ethernet switches capable of being powered directly from low voltage 12 and 24 volt DC sources. At first glance, this seems trivial as many industrial grade switches are capable of being powered from direct 12-48 volt DC sources, but it’s a big deal for PoE switches. PoE switches need to output 48VDC on the Ethernet lines in order to deliver power to connected PDs (powered devices) and therefore usually require connection to a dedicated 48 volt DC power supply – something that adds cost and complexity to an installation that might already have local 12 or 24 volt power available. Comtrol’s -VB class switches overcome this hurdle by incorporating special DC-DC conversion circuitry that allows the switch to be powered by the lower voltage and ups the voltage internally to output 48 volts on the PoE lines. 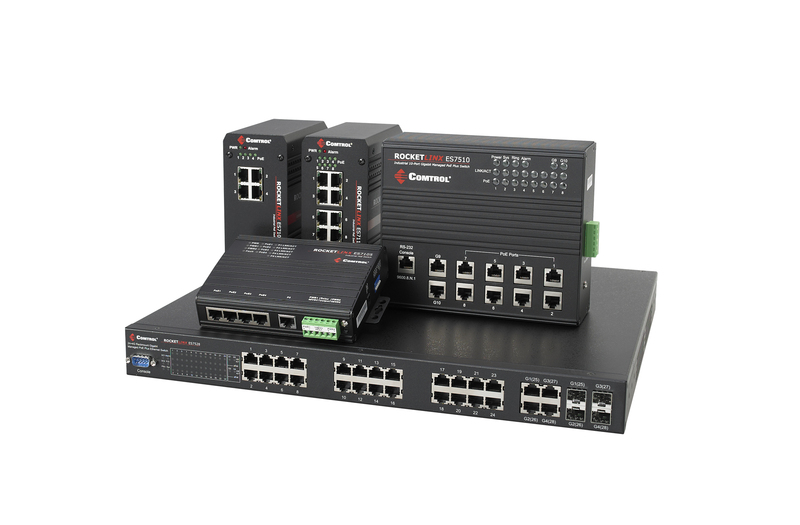 The demand for PoE capable switches to source power to PoE devices has increased sharply in recent years with the rapid and widespread adoption of PoE devices and their clear benefits for simplifying installations and lowering deployment costs. 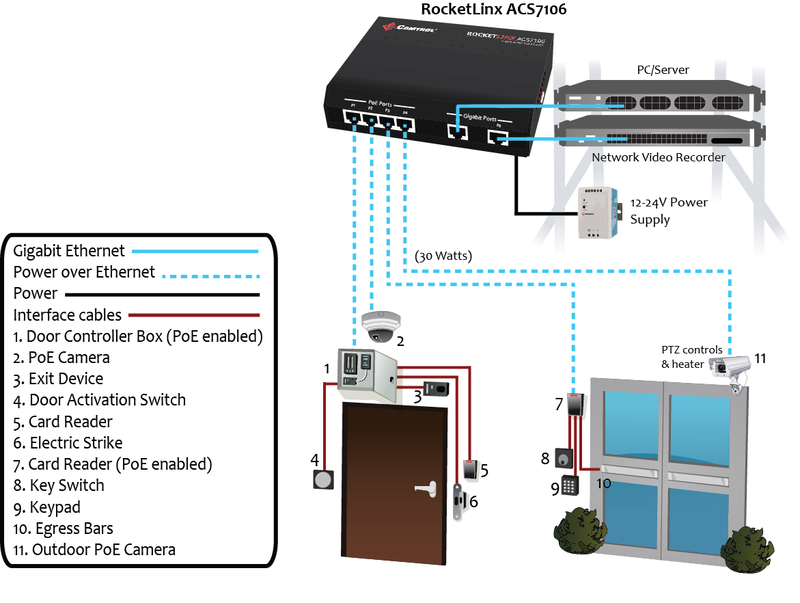 From PoE’s initial use in corporate PBX and telephone systems, it is now commonly used for connecting WiFi access points, access control systems, and the new class of security and surveillance IP cameras that are rapidly overtaking the older CCTV technology. Comtrol has released A&E specifications sheets for the following RocketLinx switches – and more are scheduled to appear on our site soon! As system developers and integrators know, Architectural & Engineering specs created for specific products are convenient and save time when writing a full project design spec. 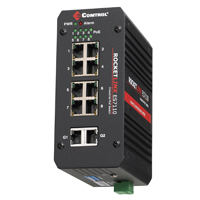 Earlier this month, we released the new industrial Power over Ethernet switch with ‘Voltage Boost’ technology. This enables the switch to receive power from common 12- and 24-volt supplies which are typically needed to power PoE systems. 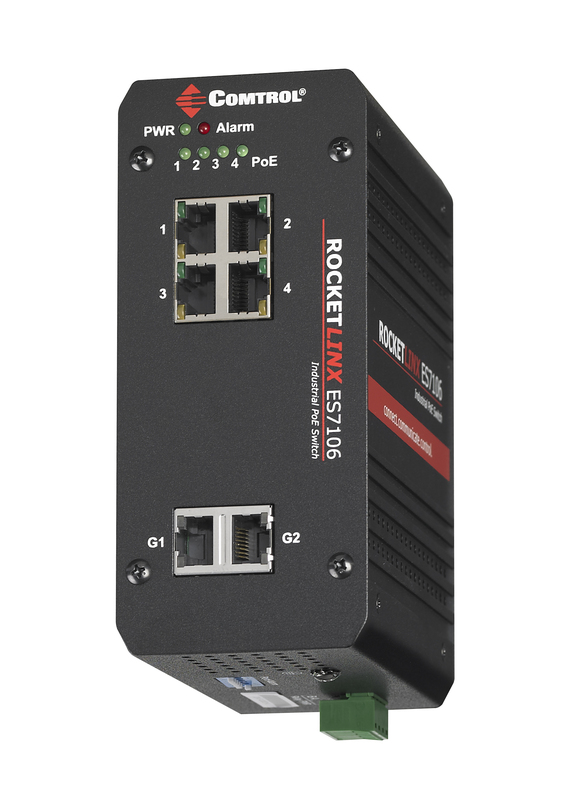 The unmanaged RocketLinx ES7110-VB switch enables easy drop-in PoE device connectivity in transportation, factory and industrial settings while powering devices such as IP surveillance cameras, scanners, wireless access points and point-of-sale systems. 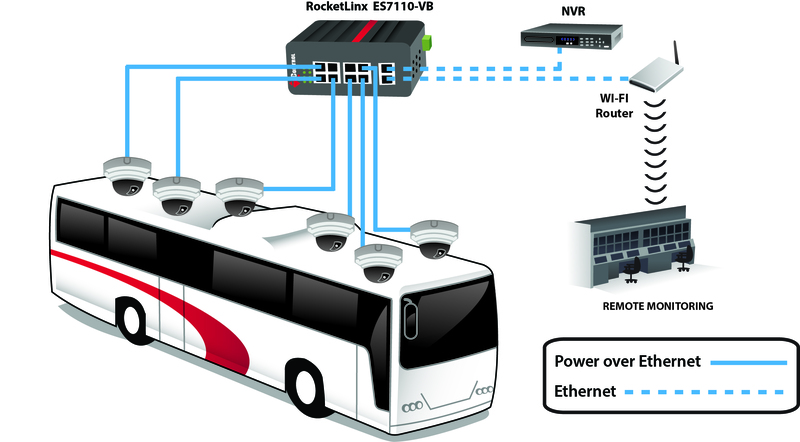 Along with advanced PoE and networking capabilities, the ES7110-VB is designed for reliable deployment in harsh conditions, with advanced features including redundant power inputs, port alarms, and an IP31-rated industrial aluminum housing. The extended operating temperature range ensures consistent operation in places such as mass transit vehicles, factories and outdoor settings. For more information and specifications, click here!